Andrew was one of the semi-finalists in the 2018 Stulberg International String Competition! In 2015, he won the Second Gershwin International Music Competition. Andrew performed on NPR’s From the Top with Host Christopher O’Riley, Show 300, recorded in Boston, MA, on February 7, 2015. 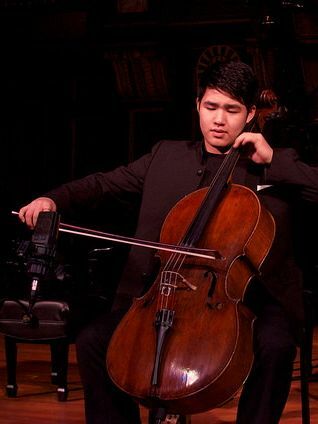 Andrew Byun (cello), 16, is from Boston, Massachusetts, and he attends Milton Academy. He studies cello with Emmanuel Feldman and is the Assistant Principal Cellist of the Youth Philharmonic Orchestra at the New England Conservatory Preparatory School. Andrew has attended the Great Mountains Music Festival, the Mozarteum Summer Academy, and the Festival Youth Orchestra. He is currently a participant in From The Top’s Center for the Development of Arts Leaders, through which he works with schoolchildren at Chittick Elementary School and a member of the From The Top Community Performance Program. Outside of music, Andrew enjoys basketball, sightseeing, and hiking. Andrew is a Jack Kent Cooke Young Artist. Andrew is a member of the Center for Development of Arts Leaders (CDAL) in Boston.